The concept of the library telescope program is that library patrons will be able to check out telescopes from their library similar to how they check out books and other media. This will provide them with hands-on experience of viewing objects in our universe with a small, easy to use, and high quality telescope. With it they may see the moon and its craters, Jupiter and its bands, Saturn and its rings, and many of the brighter star clusters and nebulas. Longmont Public Library. 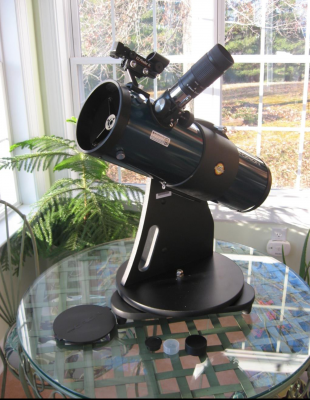 We donated 5 telescope kits in the fall of 2014 and early 2015. We received a grant from the Horkheimer Foundation for a sixth telescope in September 2015; the items to complete that kit were also donated by LAS. Louisville Public Library. On June 1, 2016 we donated 2 telescope kits and received a Horkheimer Foundation grant for a third telescope; we also donated items to complete that kit. Carbon Valley Library District. We donated 3 telescope kits and assembled kits for an additional 6 on October 1, 2017. Broomfield Public Library. We donated 2 telescope kits in January 2018.